No halloween or horror fancy dress costume would be complete without adding some blood to make your character even more scary. Our Professional Theatrical Film Blood is extremely realistic and can be used on old clothes and the face and body for a convincing bloody effect. 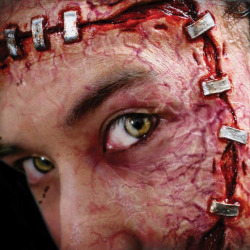 Complete the look with other latex prosthetic wounds and mutations from our range of halloween horror makeup.